These are the powerful words of coastguard winchman ‘Spike’ Hughes who lifted fisherman Reegan Green out of the water when he was flung into the sea in treacherous conditions. Reegan was wearing a lifejacket which kept him alive for over an hour before the coastguard helicopter rescued him. 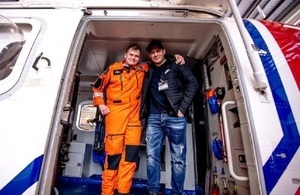 Reegan and his crewmates have been overwhelmed by the positive reaction his incident has had on fishing communities around the UK.